Dr. Bernard Creed is a qualified Certified Public Accountant (CPA) with over 30 years of experience living and working in Ireland, Scotland, Bahrain, Dubai, the Dutch Antilles and the United States. His career has seen him work in the textile manufacturing, mobile telecommunications, private practice and the travel retail business. Bernard has over 17 years’ experience working in the duty-free industry, having previously worked for Bahrain Duty Free (1998-2001) and for Dubai Duty Free (2001-2007). 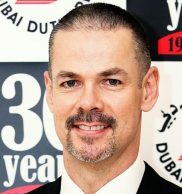 Bernard returned to Dubai Duty Free in May 2010 to head up the Finance Department as Finance Controller and was named Senior Vice President – Finance (Retail & Leisure) in July 2016. In addition to his CPA qualification, Bernard holds a Masters in Business Administration and a Doctor of Philosophy (PhD) degree. In October 2013, Bernard was elected Chairman of The Irish Business Council in Dubai, a position he held for two years.